With the ongoing advancement and globalization of our economy and society, expectations are growing for academia to help support local communities with advanced education and research. We believe that meeting such social expectations and pursuing education and research based on local needs are important duties for Toyo University. Therefore, we collaborate on various initiatives with local governments, companies, and other parties. The year 2020 is just around the corner, and the Tokyo 2020 Games will provide opportunities to contribute to society and share the enjoyment of sports with the general public. Toyo University, as a “university open to and standing by local communities,” is engaged in a wide range of such activities. For participating students, these activities serve as valuable hands-on experience for acquiring basic abilities necessary for working adults. Skills include problem solving, planning, teamwork, communication and task completion, as well as taking an interest in society. With the Tokyo 2020 Games as a common focus, Toyo University students, faculty and staff members are collaborating with local communities in building vigorous communities. The following are some examples of these activities. The Asaka Shooting Range of Japan’s Ground Self-Defense Force will be used as the venue for shooting in the Tokyo 2020 Games. To take advantage of this opportunity, the Asaka Campus’ Department of Human Environment Design, Faculty of Human Life Design concluded a cooperation and partnership MOU with the Saitama Prefectural Southwest Area Promotion Center in May 2018. The collaborators will work to raise awareness to achieve greater public recognition of shooting as a sport and to promote the southwest area of Saitama Prefecture. The activities produced “scallion rifles,” developed by students of Associate Professor Ryo Kashiwagi’s seminar. Scallions are a specialty of Saitama Prefecture, and their resemblance to rifles inspired the students to develop the scallion rifles. They created scallion-shaped resin pieces with a 3D printer and attached beam rifle parts to them. Each target is designed so that a local Saitama Prefecture mascot jumps up when the beam hits the target. Since July 2018, scallion rifle experience booths have been set up at multiple events in southwest Saitama. They proved popular, attracting many visitors who enjoyed trying the scallion rifles, including children. Various projects involving scallion rifles are being planned in the run up to 2020, when the Olympic and Paralympic Games will be held in Tokyo. The blind marathon is an official Paralympic event, in which visually impaired athletes run 42.195 km. Guide runners support blind marathoners by running alongside them while holding a rope which the marathoners grab. They play an important role in directing visually impaired runners, leading them in the right direction, helping them avoid obstacles, and sometimes giving instructions on pacing and strategies. Guide runners are indispensable for the blind marathon. In August 2018, a Blind Marathon Guide Runner Experience Event was held at the Kawagoe Campus to achieve a greater public understanding and recognition of this sport. About 80 people—citizens of Kawagoe City, local elementary and junior high school students, and members of the Toyo University Track & Field Club—participated in this event. They received a lecture from an instructor, tried using a guide rope, and had a simulated experience of being a visually impaired runner by using blindfolds under the guidance of instructors. The networks of those with visual impairments who wish to feel the joy of running, and those who wish to run to help others, are currently expanding steadily. 2020 is expected to motivate many more people to enjoy blind marathons. Toyo University held Next Athlete Forum 2018 at its General Sports Center in Itabashi City in collaboration with five Olympic Partner companies* and Itabashi City. The program is aimed at assisting the development of next-generation athletes and creating a favorable sporting environment. In this program, Toyo University faculty members, as well as University alumni and current students who are athletes, served as instructors in various sports. Swimmer Kosuke Hagino (of Bridgestone; alumnus of the University’s Faculty of Letters) and Toyo University Swimming Club Head Coach Norisama Hirai (Professor at the University’s Faculty of Law; Head Coach of the Japanese National Swimming Team) taught a swimming class. Also, sprinter Yoshihide Kiryu (of Nippon Life; alumnus of the University’s Faculty of Law) taught a running class. Para-athlete Ryoga Yamaguchi (a candidate for a Japanese national goalball team member selected for special training; fourth-year student at the University’s Faculty of Sociology) taught a goalball and boccia hands-on experience event. These events provided children with valuable opportunities to enjoy sports together with these leading active athletes. The program also included lectures in fields closely related to sports, including sports law and dietary education, given by Toyo University faculty members and experts from companies. All of the events attracted many participants. 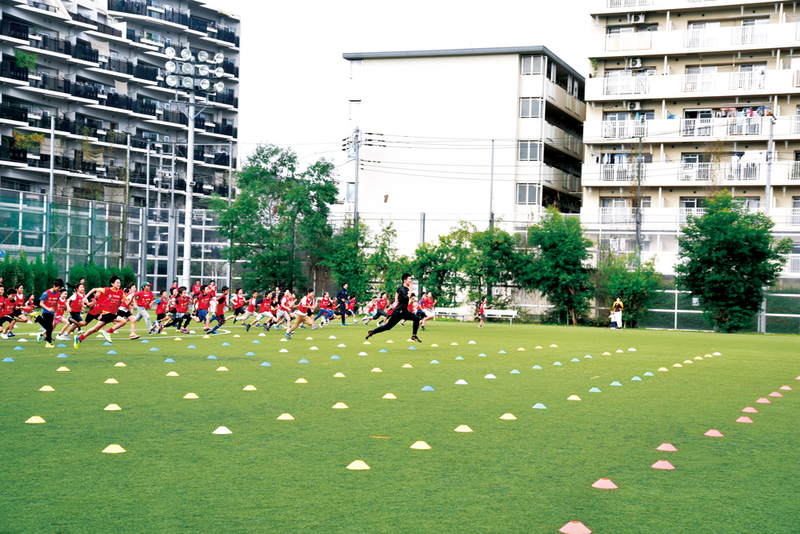 Toyo University will continue to implement various initiatives to share the joy of sports with many people. We hope that the children who see leading athletes make serious efforts to improve will be inspired, and someday become the next generation of athletes or leaders in Japanese sports culture. Toyo University is tackling the challenge of providing comprehensive support for the Paralympic Games under the management of the Tokyo Organising Committee of the Olympic and Paralympic Games. We strive to support para-athletes and instructors belonging to the University, organize lectures and awareness-raising activities to deepen public understanding about para-sports, support para-sports volunteers, and develop equipment and facilities helpful for para-athletes. As part of these initiatives, we have created a pamphlet distributed to the general public, entitled: What the Paralympic Games Teach Us. This pamphlet introduces the philosophy of para-athletes who strive to learn deeply about themselves and develop themselves through sports, as well as the challenges of competing with fellow para-athletes from around the world. It also covers the history of the Paralympics and Paralympic sports, as well as featuring messages from Toyo University athletes. It is our hope that the pamphlet will share the charms of the Paralympics from various perspectives. We will continue to pursue approaches intended for local communities, aiming to motivate many more people to feel closer to the Paralympics, watch Paralympic events, and cooperate in energizing the Tokyo 2020 Paralympic Games.